Prepatellar bursitis is an inflammation of a bursa in front of the kneecap. The patella, or kneecap, has a small fluid-filled sac just outside of it to serve as sort of a shock absorber when kneeling or to prevent friction during knee range of motion. It is normally very thin. When it is inflamed, it bursa can become large and swollen. Typically swelling is the most common complaint, although the amount of swelling in front of the patella can become uncomfortable. Typically it is not red or warm unless it is an infected bursa, which happens occasionally. Most patients with prepatellar bursitis do not remember any specific inciting event. It is often seen in manual laborers, such as carpenters, who kneel frequently. Frequent kneeling puts pressure on the bursa causing it to become inflamed and swollen. 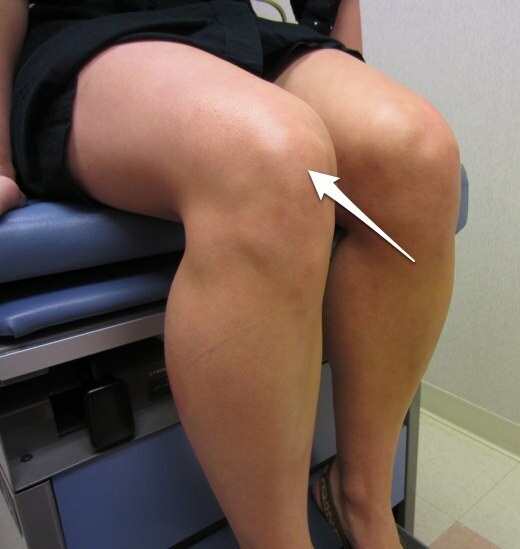 The bursa on top of the kneecap (white arrow) can get inflamed and swollen in prepatellar bursitis. Most of the time the treatment for prepatellar bursitis is symptomatic. I usually recommend that patients try icing the knee to decrease the inflammation and possibly try anti-inflammatory medications. I try to avoid drawing fluid off, if possible. In my experience, very little fluid is actually withdrawn, and it often comes right back. Also multiple attempts at draining the fluid potentially increases the risk of infecting the bursa, leading to a septic bursitis that often requires urgent surgery. Sometimes draining the fluid off and injecting cortisone one time to try to keep the inflammation from returning is an option. Occasionally nonsurgical treatments including rest, ice, anti-inflammatory medications, avoiding direct pressure on the bursa, and even repeat attempts at drainage are unsuccessful. In this case surgery can be useful. Typically the surgery involves making a small incision over the bursa and removing the entire bursa. This is usually done in hospitals or surgery centers to minimize the chance of infection. It also does not usually require full general anesthesia but can often can be done with a combination of local anesthesia and sedation or a regional nerve block. Removing the bursa surgically usually successfully resolves the problem.